Engine Four stroke, transverse four cylinder, SOHC, 2 valves per cylinder. Rear Suspension Dual Showa dampers. adjustable spring preload. When Honda released the CB500 Four in 1971 it was a big hit with nearly everyone. Those who had ridden the CB750 found the 500's lower power well compensated by other advantages. It was a bit lower and more compact and had a wonderfully balanced oversquare engine that revved freely with hardly any vibration. To those who were slightly intimidated by the size or expense of the 750 it was the perfect alternative. The smaller CB had smoothness and comfort enough for a tour across the country, and yet riders of sporting instinct found that the bike's handling responded well to a bit of juggling with the tires, shocks and cornering clearance. The Café crowd had itself a perfect middleweight toy for the bolting on of go-fast parts. And then there was a certain amount of magic because it was a Honda and a 500 and a Four, a combination Mike Hailwood had earlier put to good use. In 1974 Honda widened the bore 2.5 mm and had themselves a 544 which was called the CB550. It was mostly the same bike with a better clutch and transmission and a little more power. It was also a small step upward in the normal displacement war that gradually turns 400s into 450s, 650s into 750s, etc., until it's time to start over again at some traditional displacement level. 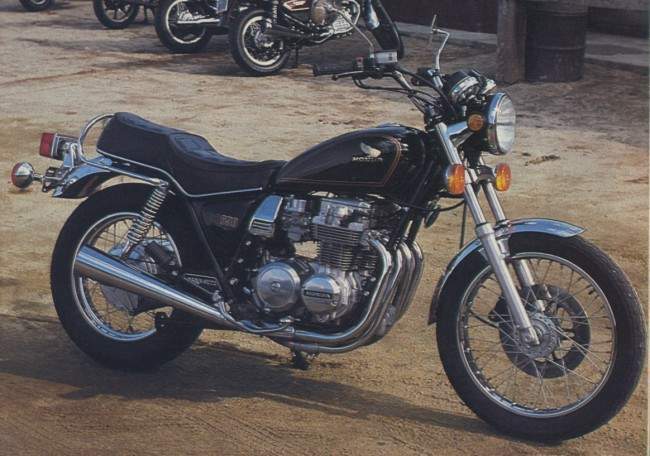 In Honda's case, it produced its own middleweight replacement by introducing the CX500 and then did yet a third redesign on the CB500 concept, bringing out the CB650 in 1979. The move was made partly to avoid stepping on their own marketing toes by having two bikes in roughly the same class, and partly to do battle with the very popular Kawasaki and Yamaha 650s. The 650s have been selling very well over the past few years and are seen by many as a nearly perfect size, neither too big and cumbersome for short trips around town nor too small and overworked on the highway. Waving the Honda engineering wand over the 550 and turning it into a 650, then, made good sense. The CB650 has been out for two years now, offered in both Standard and Custom trim, and for 1981 is changed only in appearance and mechanical detail. Wand waving, of course, is a slight oversimplification.The CB650 is not merely a rebored, stroked, or otherwise gussied-up version of the old 550. The frame is different and the engine, while of the same basic design, shares only a few minor parts with its 550 predecessor. Crank, rods, pistons, head, cases and barrels are all changed. The engine is classic Honda Four of the Seventies (and late Sixties); an inline multi, two valves per cylinder, single chain-driven overhead camshaft, adjustable rocker arms, a chain primary drive, and—big news at one time—four carburetors. Those essentials have been updated a bit on the 650 with the addition of transistorized breakerless ignition, and, for the first time this year, CV carbs. The change to 26mm Keihin CVs was made for '81, Honda says, to meet emission requirements and because Honda engineers feel the constant velocity carbs simply work better in this application. Because the needles in the carbs respond to vacuum rather than the direct pull of the throttle cable they do a better job of getting through throttle transitions without going over-rich. The vacuum cushions the effect when the throttles are yanked open. CV carbs should also provide a lighter throttle pull at the wrist because the cable is opening four butterfly valves instead of lifting a row of throttle slides. Honda also says cold starting and running should be better with the CVs. In practice, these advantages are not always evident. We've ridden plenty of bikes with CV carbs where the throttle return spring was too stiff, throttle transitions felt vague and mushy when not surging, and the carburetion was abysmal when the motor was cold. Fortunately, this is not the case with the CB650. Throttle return is light, response is good, though perhaps not quite as crisp as the slide throttle carbs on the KZ650, and the bike warms up and runs well, provided you give it just the right amount of choke. You have to play with the handlebar mounted choke knob a bit if you ride away before the 650 is completely warm. Too much or too little and the engine staggers. In these times when double overhead cams and shimmed valve buckets have become the norm in Japanese Fours, the CB650 is unusual in that it continues to open and close its valves with a single cam and rocker arms with threaded adjusters. Valve adjustments will have to be made more often with this arrangement, but those who like to work on their own bikes will enjoy setting valve clearances with nothing but a few simple hand tools, rather than removing cams or prying out shims and running to the dealer for the right replacements. Those who pay the dealer for this maintenance work will also come out ahead because the job is easier and quicker for the mechanic. This feature alone may sell a few 650s for Honda. Only Suzuki, with their screw-adjusted dohc arrangement on the 16-valve GS1100 and GS750 offer an equally inviting tune-up procedure on a big multi. The maintenance regimen is further simplified by transistorized ignition, as before, and a new 530 O-ring drive chain with sealed lubrication. The simple-and-easy approach is a strong part of the appeal Honda has used in promoting the 650 in the past. By keeping the design basic uncluttered with mechanical and electronic novelty, Honda has held the list price at $2398, which is $250 less than the Custom version of the same bike. Economy means different things to different people of course, and there are many riders who would prefer the simpler approach at any cost. In a sort of cheap-is-beautiful ethic, the CB650 is a bottom of the line model with light, good looking wire wheels (because they are cheaper), a drum rear brake which works in the rain (because it is cheaper), and clean, straightforward instrumentation without digital readouts or control panels (cheap). Which in the minds of many motorcyclists are all more desireable than the expensive alternatives. Some of us would pay extra for such a low-rent version of any number of machines now on the road. Lack of frill helps make the 650, at 458 lb., the lightest bike in its class. People who remember less technologically advanced times will argue that's still about 50 lb. too heavy for a 650, and it is, but the Honda is 35 lb. lighter than the KZ650,12 lb. lighter than the Yamaha 650 Maxim 1 (admittedly a shaftie) and 9 lb. under the Suzuki 550. The only big bike lighter than the CB is the Triumph 750 Bonneville, which beats it by 33 lb. Reasonably light weight and a stepped seat give the bike a low, agile feel that will be appreciated by people with short in-seams. It steers easily at any speed and has a willingness to go where you aim it in corners. On fast switchbacks the Honda can be tossed back and forth effortlessly in changes of direction, and it is in that mode that the CB's relatively low weight is most easily noticed and enjoyed. Pushed very hard into slower, tighter corners the front tire likes to crawl to the outside and requires a small amount of steering into the corner to hold it's line. By that time, of course, the footpegs are dragging heavily, so at least you know the limit is near. As a happy coincidence, cornering clearance and tire quality are both fairly average and run out of new ideas at roughly the same time. Better tires would clean up the 650's cornering act a bit, but as is, the bike really has no handling faults that will be noticed in everyday average-to-brisk riding. Riding comfort is so-so. The Honda is equipped with high and long handlebars, footpegs that are fairly far forward, and a low seat, all of which perch the rider in sort of a Hertz-puts-you-in-the-driver's-seat position. The step in the seat prevents you from sliding rearward to stretch your back and the handlebars set you bolt upright so all your weight is carried on your tailbone. Shorter people, or those who take short trips around town may find the bike comfortable enough, but no one on our staff liked sitting on the motorcycle for longer rides. Different bars would help most; a flat seat would help more, though it couldn't be as low. Style is a consideration here, of course, and current style calls for stepped seats on many kinds of bikes. Fifteen years ago it was Beatle boots that pinched your toes. The seat padding itself is firm without being hard and uncomfortable, and the front forks are compliant over road irregularities and won't dive excessively or go mushy under hard braking. The CB650 has air forks this year, as do all Honda's road bikes from the Hawk up. The range of air adjustment offers all the latitude you need for varied pavement and load conditions. Honda also advertises that the forks are now using dual low friction "Syntallic" bushings, which are described as a slippery synthetic material bonded to a metallic bushing base. Honda claims a substantial reduction in stiction with these bushings and the forks do work very well over such surfaces as small, closely spaced road seams. The rear shocks are of Honda's VHD (variable hydraulic damping) design and have five spring preload adjustments. The transmission this year seems less smooth than that in the first CB650 we tested. It shares with the 1981 Hawk a notchy feel and likes to hang up in neutral between 1 st and 2nd gear unless the rider makes a deliberately firm shift. It's disconcerting to leave a stoplight in a hurry, shift into 2nd gear and find yourself coasting with the tach pegged. The sloppy or casual shift from 3rd to 4th will also yield an occasional false neutral and resulting engine whoop. Hard on the valve train. One of our taller (not to say outland-ishly misshapen and gangly) riders found that his left knee rested against the cylinder head whenever his foot was in shifting position on the peg. Not for long, though. The cylinder head is hot. For average tall riders this presents no threat, but the very long legged will have to exercise care or risk melting their polyesters. Another change from the original CB650 is gas tank capacity. The old tank held 4.8 gal. and the new one holds 3.6; an odd move in these times of the troubled gas station. Our test bike, however, got 56 mpg, an improvement of 7.5 mpg over the last 650 we tested. The tank runs dry right around 180 mi., and you then have a fairly small .37 gal. reserve, or about 20 mi., to find yourself a gas pump. Like its precursor, the CB550, mileage figures on the 650 can be driven downward considerably by aggressive riding. On a long mountain loop, trying to keep up with a bigger, faster bike, mileage sank to 43 mpg. Still not bad, and much better than the old 550 under similar conditions. The gas cap is the unlock-and-remove type, which leaves you with a dripping cap to set down somewhere while you refuel, usually on the seat where it leaves gas droppings. In the world of better ideas, we have a hard time faulting hinged gas caps; they're more durable because they never roll off the seat and take a bounce on the concrete. And you don't have to put them anywhere. The 650's instrumentation is excellent. Speedometer and tach are both accurate and the instrument faces have Honda's new luminous dials which at night offer clear, easy to read numerals that don't distract your vision with too much light. Between the separate round tach and speedometer bodies is the familiar Honda warning light bar that carries bulbs for oil pressure, neutral, high beam and turn signals. The turn signal switch, which must be returned manually, and the high-low beam switch are well separated on the left grip and easy to reach without confusion. On the road the CB650 has that same smooth, glossy civility made famous by the 500 and 550. There's not a great deal of mid-range punch, but the motor builds horsepower with rpm and delivers its best acceleration in a series of electric motorlike surges carried to redline. It will pull happily at much lower rpm, of course, but acceleration is more leisurely below 5500 rpm. Between 55 and 65 mph, or the speed we most often cruise, the engine is smooth and quiet. At around 70 mph, or 6000 rpm in high gear, the engine develops a buzz that can be felt through the pegs and grips and seen in the fuzzy cars in your rear view mirror. The vibration is not particularly bothersome, especially if you've just climbed off your Norton PI 1 Ranger; it's just not as smooth as the rest of the rpm range. The 650 does not share the new twin piston disc brakes found on Honda's sportier '81 models, like the Hawk and the 750-900F models, but has a single large piston with pads acting on an 11.7 in. disc. The rear is a 7 in. drum. Nevertheless, brakes on the CB stop the bike in a respectable distance, 133 ft. from 60 mph and have a solid, progressive feel. Even our drag strip rider, who does the brake tests and also has to haul the bike down in a very short time at the end of every half-mile speed run, commented that the brakes were predictable and easy to control. The only flaw in the brakes is a tendency to squeal at low speeds. The front pads also drag on the rotor at low speeds even when the brakes are not applied, setting up a low-pitched but quite audible squall at anything below 10 mph. People in the house will know when you pull into the driveway. Drag strip performance for the CB650 is good without being stunning or setting new records. Our test bike did the quarter in 13.33 sec. at 97.29 mph. This is 0.05 sec. quicker than the first hot version of the CB750 we tested in 1969, though 2.82 mph slower. The CB650 is both quicker and faster, however, than the 1975 CB750F we tested, and fuel economy is better by a whopping 22 mpg. Compared with current competition the CB gives away some performance to both the KZ650 and the Yamaha Maxim 1. Our last KZ went 13.19 sec. at 98.46 mph, and Yamaha's new 650 Midnight Maxim we just tested ran a spectacular 12.84 at 101.80 mph. Doesn't look that much quicker on paper, but feels it.